Children at Woodside Academy have been learning Mandarin now for four years, and Chinese New Year is always a special event in the calendar. 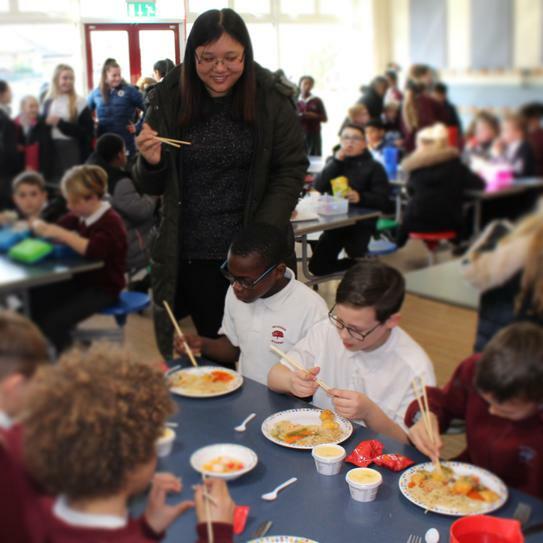 Celebrations started during half term when year 6 were in school for special booster classes after which they cooked their own Chinese meal. Since half term classes have been working with Li Binglei, the school’s Chinese Language Assistant, on New Year related activities, including learning to sing and play the song Jasmine Flower in Mandarin. The school kitchen cooked a Chinese lunch and children were able to eat Chinese noodles with chopsticks and enjoyed lychees and fortune cookies. The celebrations finished with the Chinese lantern festival when all the classes are shared their Chinese New Year activities, together with video contributions from our partner school in China, in a special assembly for The Year of the Dog. We added Mandarin to Spanish as it is the major world language and our children will grow up in a world where China is also the biggest economy. Mandarin, Spanish and English in that order are the three most spoken languages in the world.